Forget meth, cocaine and heroin: Prescription drugs are the No. 1 killer in the Inland Northwest. And the epidemic shows no end. Lacey Jones was sliding. A sophomore at Whitworth, Jones had transferred from Washington State to play softball, the sport she loved. She was practicing sliding one day in February 2002, gliding over the grass again and again, when her metal cleats dug into the turf and her ankle popped. The doctor told her it was broken, cast it and gave her Vicodin, a commonly prescribed narcotic. Two years later, Jones found herself on another field of grass, in Coeur d’Alene Park near downtown Spokane, with her dogs, Teeny and Tiny. An older homeless man named Fuzzy approached. “You know anybody that wants to buy some methadone?” he asked her. Jones is lucky. She survived. Not everyone’s so fortunate. It’s an all-too-common remedy in our society: magic pills for every imaginable ailment. Increasingly, though, the pills often do more harm than good. Prescribed by a doctor, made in a sterile lab and approved by the federal government, pain medication has become something once reserved for the street corner: a highly addictive drug that users will do anything to obtain. Crime is up, solutions are elusive and, most importantly, more and more people are dying. In 1999, five people in Spokane County died from accidental prescription drug overdoses. In 2008, that number jumped twenty-fold, to 100. The autopsy room for Spokane County is housed in Holy Family Hospital. Gleaming with stainless steel and decorated with diagrams of the human body, this room sees as many as 600 bodies a year. Some bodies don’t hide their secrets from Dr. Aiken. There are the bullet wounds, the abrasions from a hanging, or the telltale signs of a car accident. But some, at first, are mysteries. “The ones where we wait for toxicology to come back, we have to wait,” she says. “There’s not a way we can look and say, ‘There’s going to be a positive or negative for this or that or whatever.’” This or that or whatever, says Aiken, usually ends up being methadone, oxycodone or hydrocodone. In just eight years, between 1997 and 2005, the amount of five major painkillers sold at U.S. retail pharmacies rose 90 percent,according to Drug Enforcement Administration figures. In 2006, about 39,000 Americans died from drug-induced deaths. While motor vehicle crashes still kill more people every year — with 45,000 in 2006, it was still the No. 1 accidental killer in the nation — those rankings are quickly reversing, state by state. In 2003, eight states had more drug-induced deaths than car crashes. In 2006, it went up to 16 states. Washington’s drug deaths outpaced car accidents for the first time in 2004, when 695 Washingtonians overdosed and car wrecks killed 679. Methadone, once used exclusively to treat heroin addiction, now accounts for the majority of overdoses, thanks to its reclassification earlier this decade as an “analgesic,” meaning a painkiller. “If anything, we probably underestimate the number of prescription drug overdoses because not every case gets autopsied. Not every case gets toxicology done,” says Dr. Robert West, Kootenai County’s coroner. In 2006, West performed 11 autopsies that revealed prescription drug abuse. In 2009, he did 15. Back in Spokane, Aiken’s not sure when the deaths will plateau. Ken Zigler remembers the last time he spoke with his 17-year-old son. Tim, a junior at Spokane’s Ferris High School, was home late from his job at the Spokane Valley Mall one Sunday night in March 2006. He took a shower and told his dad he was going to bed with a headache and some chest pain. “I went down there to talk to him for a while,” Zigler says. “I said, ‘OK, Tim. I’ll check on you in the morning, see how you’re feeling.’” The next morning around 6:30, Zigler went down to check on his son before his alarm went off. Heading into the dark basement, he heard Tim snoring loudly, and breathing very deeply. “We thought, ‘What’s methadone?’” Zigler says. Since then, Zigler’s learned. Methadone is a narcotic painkiller similar to morphine. Its half-life is much longer than other narcotics, and it can stay in a person’s system days after that person no longer feels its more euphoric effects. By itself, and when combined with other opiates, it can slow a person’s breathing to fatal levels. Tim got the methadone pill from a 15-year-old classmate. In these four years, Zigler has shared the things he’s learned. “I’ve gone up to people in the grocery store. I’ve even gone up to the kids skateboarding in the street. It’s like I have no fear anymore.” Through the Greater Spokane Substance Abuse Council, he’s spoken to 38 groups — schools, neighborhood groups, nurses — to tell them about Tim. Which brings up the question: When does someone’s addiction become society’s problem? According to the Spokesman-Review, there were 19 pharmacies robbed in the Inland Northwest in 2008, 17 of those for OxyContin. And earlier this year, Walgreens installed special time-locked safes only in its Washington stores. Assistant U.S. Attorney Ron Friedman, who has focused on drug prescription cases since 2005, was quoted last year as saying that pharmacy robberies in Washington state have increased by 25 percent since 2007. “It by far exceeds the surrounding states of Oregon, Idaho and Alaska,” he said. Within three weeks of first trying OxyContin, Jason had one priority: getting more Oxy. Jason, who spoke on the condition that his last name be withheld, is as normal-looking as they come. He grew up a clean-cut kid — a good student from a good family in Spokane. He attended the now defunct Dynamic Christian Academy and went off to Spokane Falls Community College a year early. He was going to be a high school math teacher. The first summer out of high school, he smoked pot for the first time and he liked it. He played drums, many times at his church’s worship center, and just coasted along for a few years — mildly partying and being very involved in his church. Then he got a job selling phones out in the Valley. On his first day, he struck up a conversation with a co-worker. “Drugs came up,” Jason says. “I told him that I smoked pot, whatever.” His co-worker offered him some OxyContin, an eighth of an 80-milligram pill. After his first withdrawal, he didn’t let himself run out again, and a year later a friend of a friend showed him a new way to get high — with the same drug, but with a needle in his vein. Soon, he had abscesses and bruises up and down his arm. By shooting up, he had doubled his usage. Every day, he says, he’d shoot somewhere between 160mg and 600mg — the equivalent of up to 30 pills. His parents found out and sent him to a residential rehab center in Kirkland. Three months after coming home, he started using again. He never shot up again, but he kept himself high. He cycled through narcotics: oxycodone, heroin, methadone. He lost his job and had trouble staying afloat. Then he met a doctor who prescribed methadone. For two years, the doctor kept him on methadone and Jason hoped to wean himself. Then the doctor was shut down by the DEA. On his way out, the doctor had prescribed Xanax to help Jason get through the withdrawals that would eventually come. One night, Jason popped a bunch and left the house. He drove — he can’t remember why, exactly — and got really tired. He pulled over and went to sleep. He woke up, got out of the car and accidentally locked himself out. He smashed the window, crawled back in and fell asleep again. Next time he awoke, a cop was tapping his shoulder. Jason had a pot pipe and the Xanax on him. He went to jail. He had hit rock-bottom, and he had had enough. Jason is a year away from getting an accounting degree from Eastern Washington University. But he’s still cautious. Jerry Fougere — who has seen the dramatic increase in prescription drug abuse firsthand at Lakeside Recovery — says there’s only one solution to lowering the number of dead addicts: education. For those people, addiction progresses, sometimes to prescription drugs. “There is nothing in nature that’ll make you feel like Oxy will,” Fougere says. Fougere dismisses many chemical treatments such as methadone as being too simplistic, but he says drugs like Suboxone may offer some help in treating addicts. Dr. Lemberger, who ran Rockwood’s Suboxone clinic until he retired a couple of years ago, sees it a bit differently. Another difference between the Suboxone and methadone is the price. A prescription for Suboxone costs about $400 per month, depending on the dose. For the same price, at the county’s methadone clinic, a patient gets full treatment — methadone, doctor’s visits, therapy, urine analyses. And though it sounds perfect, it’s not: Suboxone can kill you if it’s mixed with a non-opioid, such as Xanax. Whether chemistry works or not, Attorney General McKenna sees a different solution, one that edges toward the deliberative. He’s formed a prescription drug abuse task force, which met for the first time last Friday, Jan. 15. A monitoring program is something McKenna’s had his eye on for a while, and it’s something 40 other states use to track who’s buying these drugs, who’s prescribing them and where these drugs are going. But the monitoring program was scuttled before it even took off because of budget constraints. Regardless of where the money will ultimately come from, McKenna seems resolved to find a solution. “We are losing far more people to prescription drugs than we ever lost to meth,” he says. “Because these deaths occur quietly and are quietly reported, people have failed to grasp the magnitude of the problem. Lacey Jones’ ankle has been healed for eight years, and it’s been eight years since she was given her first prescription for Vicodin. Almost four years ago, scrambling for some pills, she went to the emergency room for a “headache” to get some heavy-duty painkillers. Her sister, Meg, saw the bill and asked why she went to the ER for a simple headache. “At that point, it was like, ‘OK, Meg. I’ve got a really big problem,’” Jones says. For more than four years, Jones had kept her addiction from everyone — her friends, family, everyone. The same day her sister confronted her, Jones’ niece was born. “I was in withdrawal when my niece was born — and that moment I saw her come into this world, I was like, ‘Oh, man. There’s more to life than getting high.’” Jones quit cold-turkey and has been clean since. 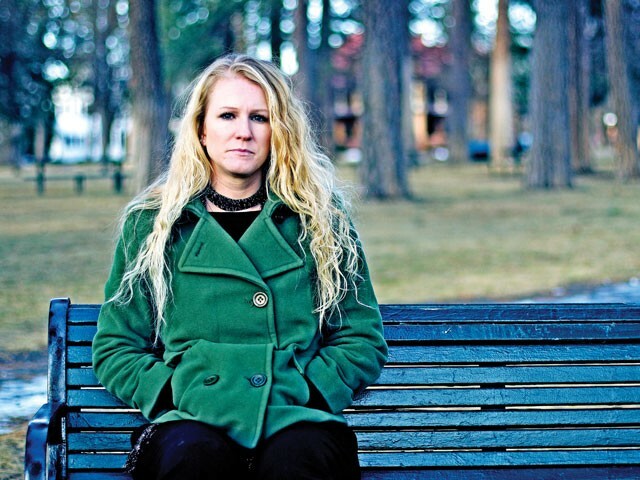 She now works for the Greater Spokane Substance Abuse Council as a drug-awareness community organizer. She’s spoken to thousands of kids in the area. Yet she still thinks about the pills. Just three weeks ago, she had a craving.